This talk draws on a multi-year sensory ethnography by Lisa Cartwright and Steven Rubin, who since 2009 have been documenting the everyday work experience and human-technology interaction in farming and ranching life on the land in Kansas communities where wind, long regarded as a potential threat to life, land, and property, has become a source of power to be "harvested" through an energy infrastructure built on small family farms. At stake is the matter of power: its scale, it visibility and its sensibility in a context of dramatic technological transformation. 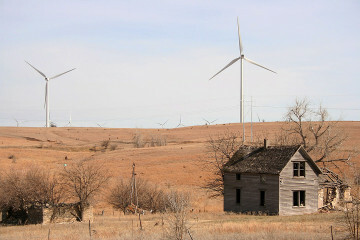 The double-cropping of wind and grain in Kansas is analyzed as a practice in which boundaries and intersections are negotiated not only between the energy industry and agriculture, but also between wind-rich and wind-poor towns, across farms, and among farmhands and wind technicians, who must learn how to share the field, and who devise new modes of facilitating and negotiating land and power. Photography and the matter of documenting this negotiation of land crops, wind crops, and their respective technologies are of particular concern in this paper, with attention to the historical place of landscape photography as a technology, the matter of wind as a uniquely invisible force, and the photographic legacy of the New Topographics in the political interpretation of contemporary land use. Lisa Cartwright is Professor of Communication and Science Studies at UCSD where she is also on the faculty of the Program in Critical Gender Studies. She works across film, media and visual studies; gender and sexuality studies; science and technology studies; and disability studies. Her most recent book is Moral Spectatorship: Technologies of Voice and Affect in Postwar Representations of the Child (Duke University Press, 2008). She is coauthor, with Marita Sturken, of Practices of Looking: An Introduction to Visual Culture (Oxford University Press, Second Edition 2008). She is also the author of Screening the Body: Tracing Medicine's Visual Culture (University of Minnesota Press, 1995). With Paula Treichler and Constance Penley, she co-edited the volume The Visible Woman: Imaging Technologies, Gender and Science (NYU Press, 1998). Steven Rubin, Assistant Professor of Art in the Photography Program at Penn State University, is a photojournalist and documentary photographer with assignments in Iraq, Rwanda, Kosovo, Pakistan, Turkey, Chile and Cuba, and throughout the United States. His photographs have been published in The New York Times Magazine, National Geographic, Time, Newsweek, Stern, GEO, Focus, L’Express and the London Independent Magazine, and in numerous books including Schattenlicht – the Best of Black and White Photography and The Century (Phaidon). His work has been exhibited in venues throughout the United States and featured at the International Festival Visa pour L’Image, in Perpignan, France. He is the recipient of the Leica Medal of Excellence, a New York Foundation for the Arts (NYFA) Fellowship, a Nieman Fellowship at Harvard, and an Alicia Patterson Journalism Fellowship.